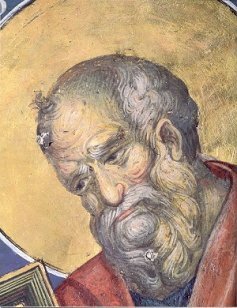 St John the Theologian. Mural in the nave of the katholikon. Around 1363. The original decoration of the katholikon with wall paintings was done at the time of the monastery’s foundation in the fourteenth century, specifically during the decade 1360-1370. According to Professor Euthymius Tsigaridas who made a detailed study of them, the murals preserved from that period are notable for their “high artistic quality” and are rightly considered to belong to the school of Panselinos. In particular, the east wall of the esonarthex is dominated by the impressive Deesis with its three imposing figures, Christ Enthroned sitting between the Mother of God and St John the Forerunner in the posture of supplicants. On the west wall of the nave are paintings of the dormition of the Mother of God as well as of great figures from the history of monasticism such as St Anthony the Great, St Euthymius the Great, St Theodosius the Coenobiarch, St Pachomius the Great, and so on. Some recent cleaning in the conches of the choir and specifically in the upper tier of the left conch of the choir, has revealed beautiful depictions of the Forefathers and Joseph the husband of Mary, an iconographical cycle and arrangement which according to Professor Euthymius Tsigaridas corresponds to that of the Protaton. Nevertheless, these Palaeologan murals were painted over almost in their entirety in 1854 by the artist Matthew Ioannou when the katholikon as a whole was repainted. This repainting is commemorated in an inscription over the lintel of the doorway leading from the nave into the lite. St Joseph the husband of the Blessed Virgin Mary . Mural in the left choir of the katholikon. Around 1363. 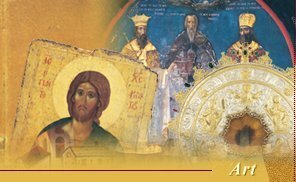 Apart from these murals, the depiction of the Ecumenical Councils, the “Words of Christ” (Math. 25, 35-36 • 42-43), the parable of the Ten Virgins and the wall paintings of the arches, the dome and the small vaults also belong to this second phase. 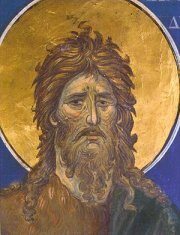 A fragment of a wall painting portraying Prophet Ezekiel has recently been attributed to Theophanes the Cretan. This fragment, which is preserved in the sacristy, must have come from the dome of the Chapel of the Three Hierarchs which was built in the southern part of the lite but demolished in 1847. It is therefore assumed that the whole of the ruined chapel was painted by Theophanes. Murals in the nave of the katholikon. Around 1363.